I have to admit that this is the only Mongolian dish that I make and other than Mongolian grill, I don’t know much about the cuisine. Eventually, I’ll cook my way through more Mongolian food, I’m sure. 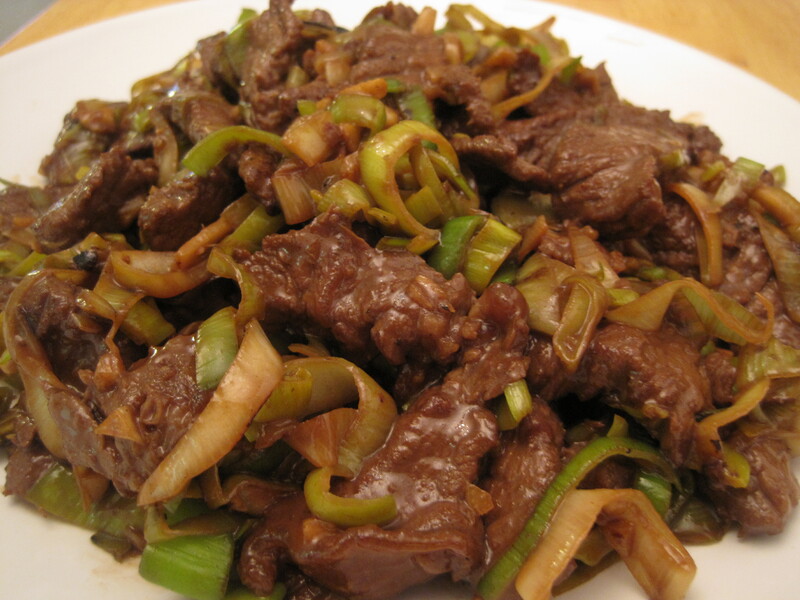 I like the sauce of this beef dish because it has a subtle sweetness to it that differs from other Chinese beef dishes. Marinate the beef slices with the seasonings for at least 30 minutes. Meanwhile, combine the ingredients for the sauce and set aside. Heat up a wok over high heat. When the wok is very hot, but not burning dry, add 2 tablespoons of oil. Then add the meat and stir fry frequently until it is half cooked, approximately 2 to 3 minutes. Do not overcook. Dish out and set aside. Heat up another tablespoon of oil over high heat and add the leeks. Stir fry frequently until soft, about 2 to 3 minutes. Add the garlic and ginger and stir fry until aromatic, approximately 45 seconds to 1 minute. Do not let the garlic burn. Add the beef back into the wok and then add the sauce. Continue to stir fry until the beef slices are almost done, approximately 1 minute. Do not overcook. Garnish with the green onions (optional). Serve hot with rice.